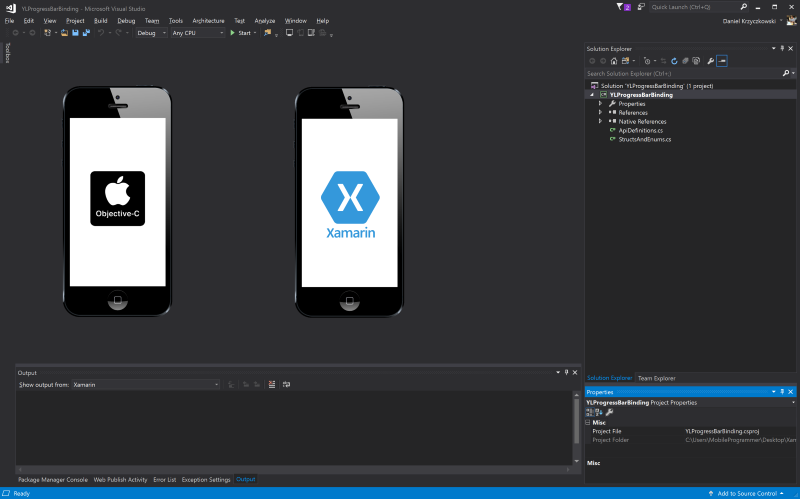 Xamarin platform enables iOS application development. 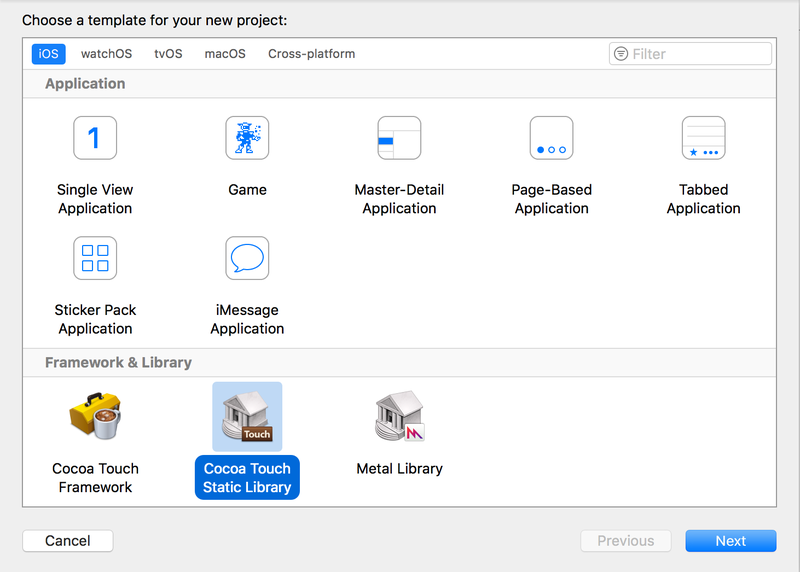 Developer has option to create application with either Xamarin.Forms approach or Xamarin.iOS. 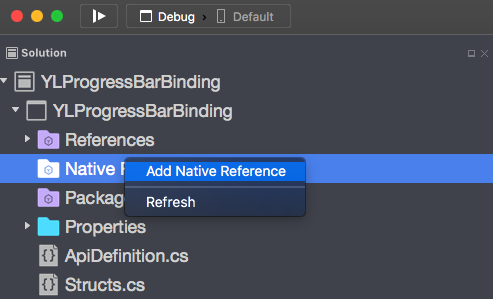 Besides which way you choose sometimes there is a need to use native libraries which are written in Objective-C. There are many open source projects available on GitHub connected, especially connected with custom controls. Of course developer can rewrite them to C# but why? 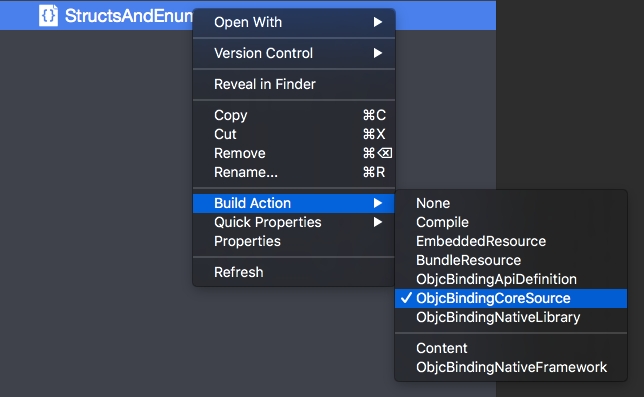 There is a another great solution to access them from Xamarin.iOS. 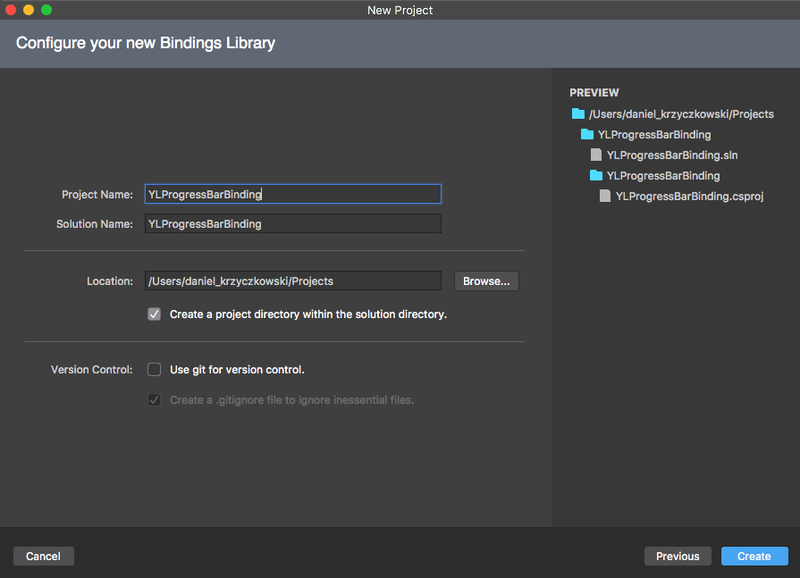 This solution is called “Library binding” and enables binding between Objective-C and C#. Developer does not have to rewrite the whole library code then. In this article I would like to present how to do such binding. There are many open source projects on Github. 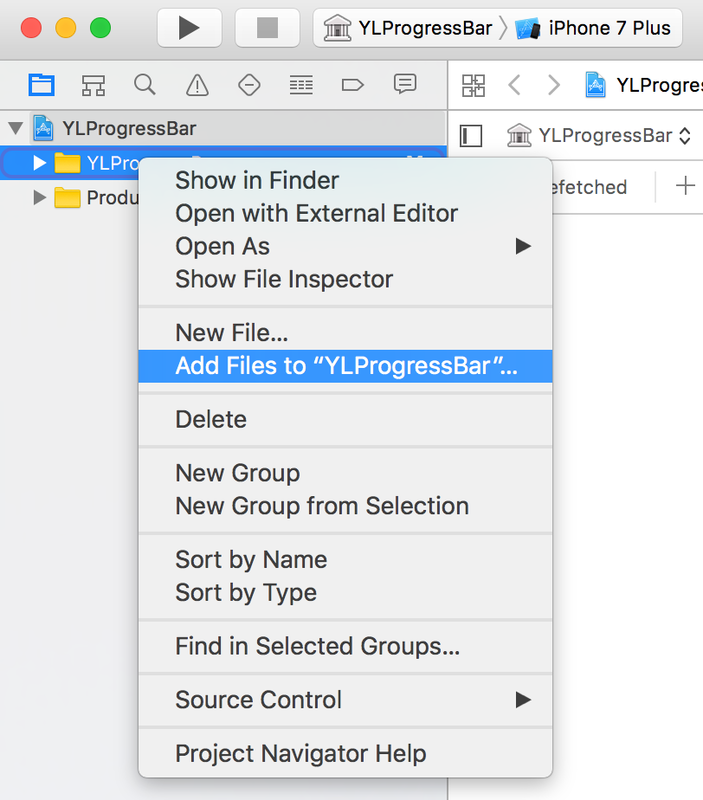 For this sample I used YLProgressBar project available here. 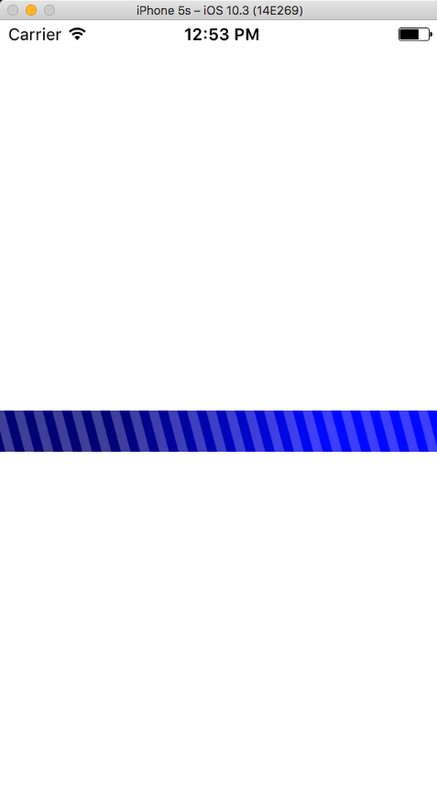 This is highly and fully customizable animated progress bar in pure Core Graphics. Our static library is ready but this is not the end. 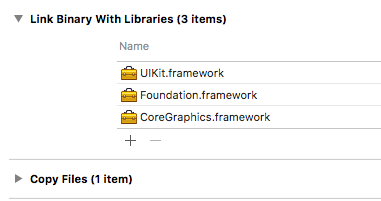 Fat library with “.a” extension contains all supported architectures in one file. To create Fat library there are many tools but in our case we will automate this process with “make”. 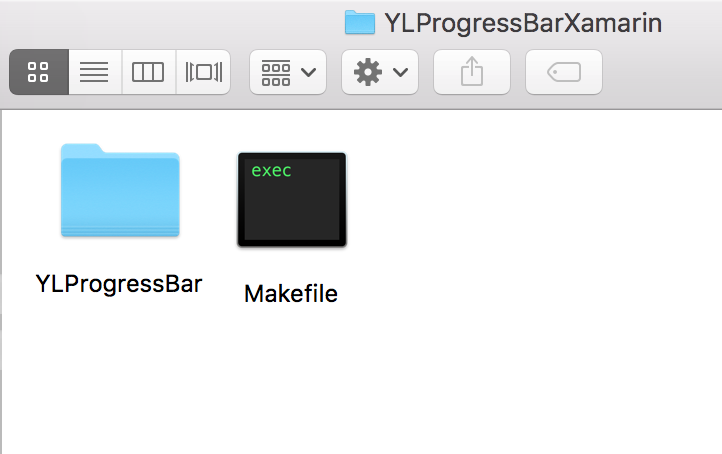 Once we installed the Xcode Command Line Tools, we also installed “make”, so that is the build system we will use here. 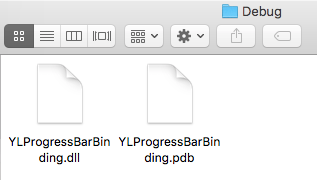 Please note that identations in the file are made with “Tab”. These are not white spaces. (lines with “$”, “-mv”, “xcrun” and “-rm”). Remember also to remove extensions from the saved file so system not recognize it as plane text file. 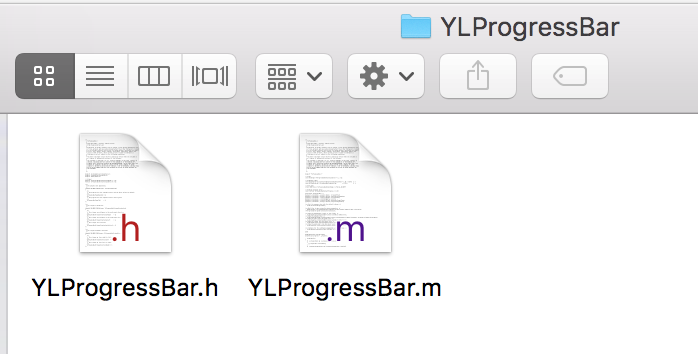 At this point our static library created with Xcode and Make command line tools is ready. 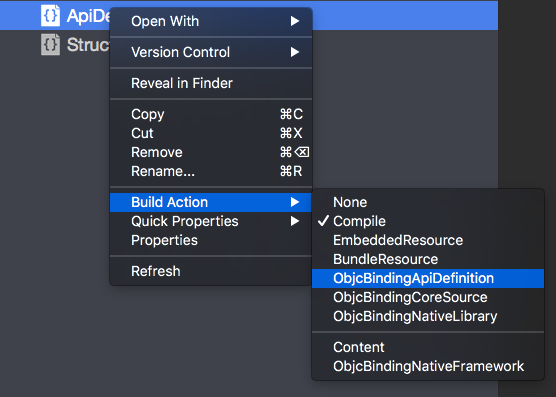 ApiDefinition.cs – file will contain the contracts that define how Objective-C API’s will be wrapped in C#. 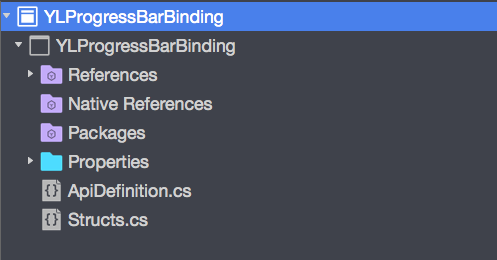 Structs.cs – file will hold any structures or enumeration values that are required by the interfaces and delegates. Done. 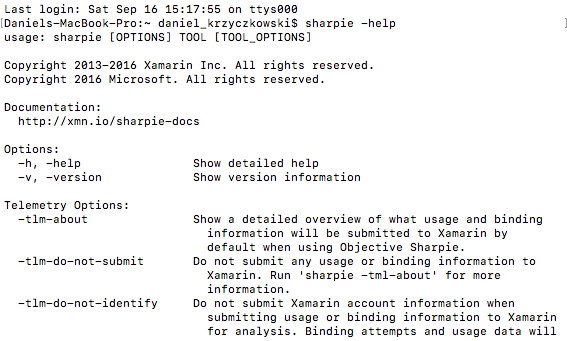 Now we are ready to use Objective Sharpie Xamarin tool. Objective Sharpie is a command line tool (provided by Xamarin) that can assist in creating the definitions required to bind a 3rd party Objective-C library to C#. 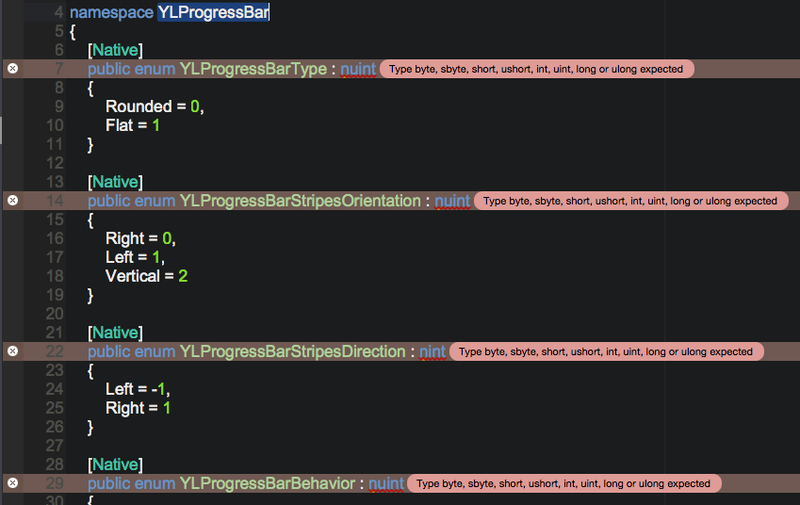 In this case I used Objective Sharpie to create the initial ApiDefinition.cs for the YLProgressBar project. 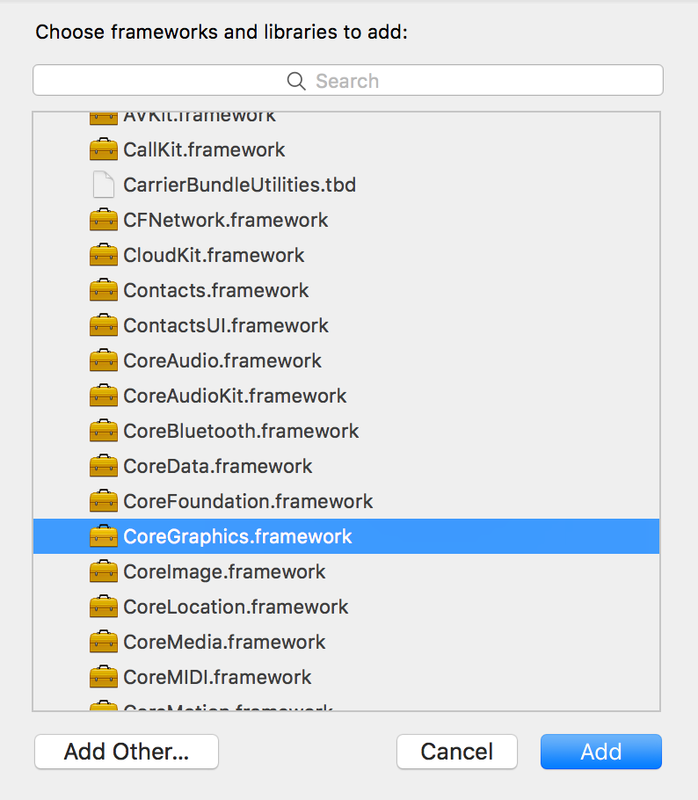 As you can see in my case I am using “iphone 10.3” SDK. With this information I can use Objective Sharpie to generate “ApiDefinition.cs” and “Structs.cs” files which contains C# code describing native Objective-C library code. Output – where two files (ApiDefinition.cs and Structs.cs) will be generated. Operations with Objective Sharpie are done. Objective Sharpie sometimes has an issue translating Delegates and some parts of code so we have to adjust definition manually. As you can see Objective Sharpie has annotated the binding with “Verify” attributes. These attributes indicate that you should verify that Objective Sharpie did the correct thing by comparing the binding with the original C/Objective-C declaration. This is sign that you have to verify assigned type. In our case there should be “NSArray” instead of “NSObject”. The best way to do such verification is to open native “.h” file and check. There is also type error. In enum here should be “long” type, not “nuint”. Once you verify all errors you can remove “Verify” attribute. You can read more about verify attributes here. If its here you can use it! We are done. 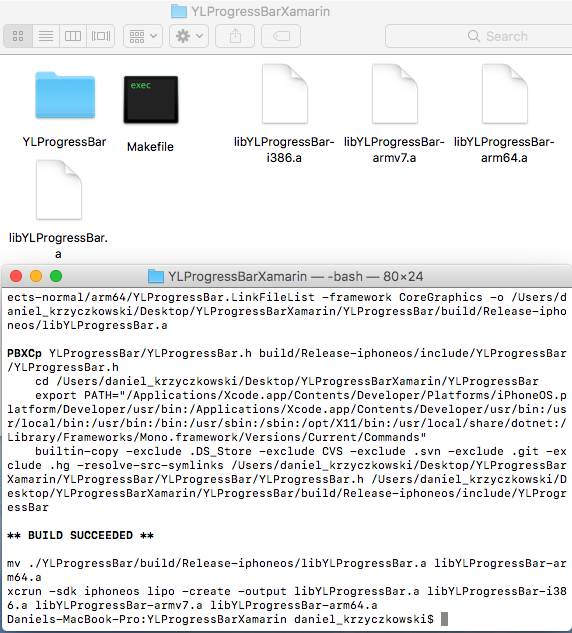 Now you can just add this dll to Xamarin.iOS application project or create NuGet package with this binding library. 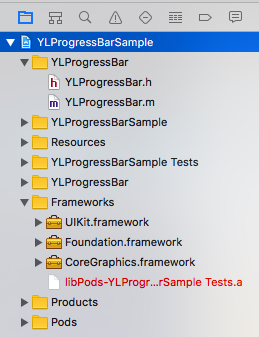 I created sample project to check if I can normally use library using C#. 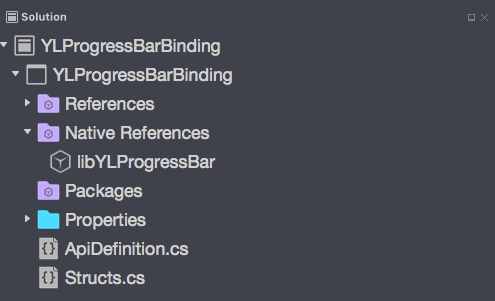 I added YLProgressBar.dll as reference. Everything works fine! What’s more – I can use C#. 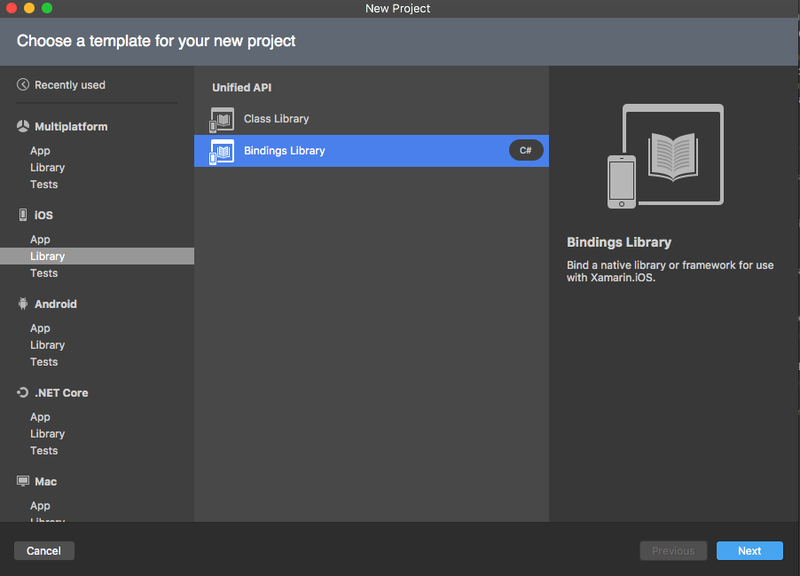 Creating binding libraries for Xamarin.iOS is more complicated and time consuming process than binding Android library but it is worth it. 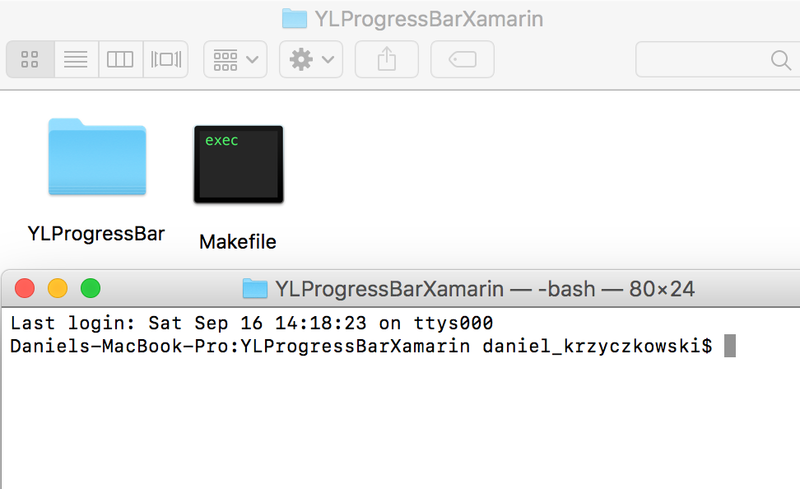 Xamarin provides such great option so even if there is some interesting library written with Objective-C we can use it with Xamarin.iOS application too. You can find my binding project on GitHub. 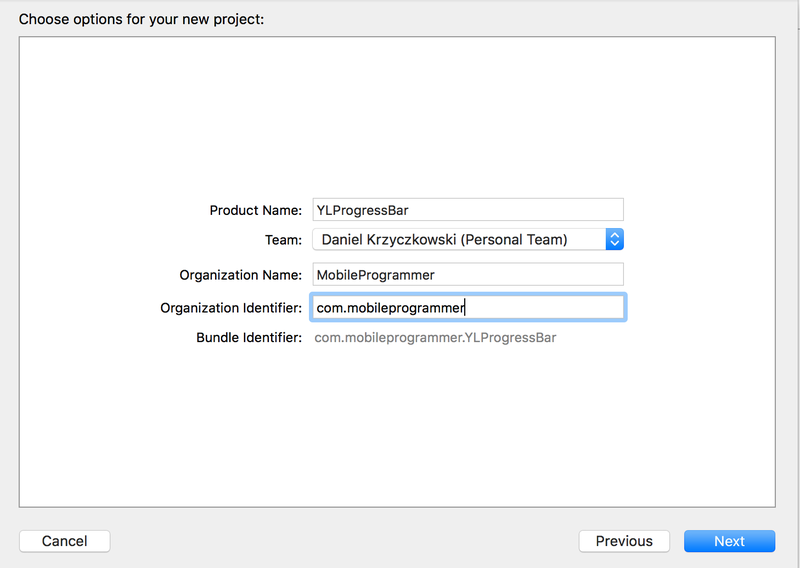 I also created NuGet package so you can use YLProgressBar in your Xamarin applications!